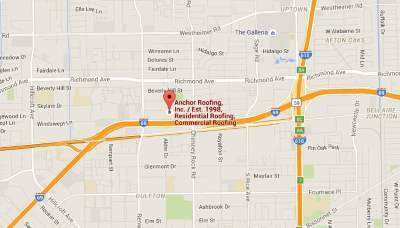 TPO Roofing is the fastest growing sector of the Commercial Roofing Industry. With manufacturer’s such as Carlisle-Syntec who, taking 17% of the total market share of all low sloped Commercial Roofing Systems last quarter, and they do not have a built up modified product line such as GAF, and Firestone, whom I do not have any up to date data on; however I am sure they took their fare share of the market. Houston’s Department on Public Works and Engineering, the Structural Authority when it comes to Local Building Code, adopting the 2009 IECC (International Energy Conservation Code) of the requirement for relative Commercial Roofs to have a mandatory Solar Reflectivity Index of 75% or greater, and the same for Thermal Emissivity it is becoming far more difficult for traditional built up modified systems to compete on the same playing field from a position of on the Roof Cost and Code Compliancy + many new buildings are being built LEED (Leaders in Energy Efficient Design) see: Leadership in Energy and Environmental Design for further clarification. TPO Commercial Roofing Systems that are Compliant to The 2006IBC (International Building Code), Chapter 15 (Roof Assemblies) as the relative building codes, and 2009 IECC Code Compliant, with their high Solar Reflectivity Indexes and their high Thermal Emissivity Indexes which translate to a more energy efficient design that has proven to lower Carbon Emissions into the Environment as well as lower Energy Consumption. In which Secretary Chu explains the associated benefits and that essentially whenever the Department of Energy has any say so in the matter that the best choice is: White Single Ply Roofing Systems, or TPO Commercial Roofing Systems, as they have far more benefits than any of their associated competitors. Don’t get me wrong, white PVC, and white EPDM roof systems, both Single Ply System also should by all means fall into the same category; however White EPDM cannot compete with White TPO (Thermo Plastic Polyolefin) roof systems from a position of cost, and White PVC (Poly Vinyl Chloride) systems may be able to compete the associated drawback of the added plasticizers and how they can contaminate rain water runoff must be considered a minus when comparing the two systems side by side. Texas is a, “Right to Work State”, and literally anyone who wants can form a Houston Commercial Roofing Company, where many states such as Florida and Arizona require mandatory licensing of Roofers and have a far more stringent protocol of what it takes to be a Commercial roofer. The City of Houston has elected to offer optional Registration; however this is not a license, merely proof that you have met the Insurance Requirements of The City of Houston Department of Public Works and Engineering. This leads the discussion to the question? How do I choose the right TPO Commercial Roofing Company, when it comes to making a decision about what Companies to consider for hiring to install a TPO roof? 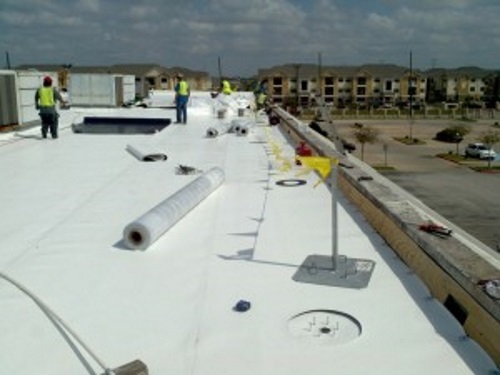 Generally most large projects be it the Public Sector or the Private Sector have Architects and Consultants involved in the specifications as well as the quality assurance of Roofing Companies allowed to provide bids to install TPO Commercial Roofing Systems, that typically require that the roofing company be Endorsed as a Certified Applicator by the Specified Material Manufacturer’s, and generally when / if the project is a “Public” project it will also require a Production and Performance Bond, also known as a P & P bond, as well as often the stipulation of being in business at least 5 years, and having successfully completed similar projects. This can significantly cut down the number of contractors that meet the requirements to provide a bid for the project, as many companies do not have the proper endorsements by the Specified Material Manufacturer’s as Certified Applicator and then when you add the bonding ability of the company, as well as if they have successfully completed similar projects it creates a level of credibility that often takes years to meet. That has proven a reliable way for Architects and Consultants to assure uniformity in the bidding process, while also maintaining that reputable established companies with a proven track record for their Workmanship and ability to provide long term Total System Warranties, also known as NDL (No Dollar Limit) warranties that are inspected by a non sales / technical representative of the Material Manufacturer prior to issuing the “NDL” warranty has become a great way to assure quality workmanship, and that the Roofing System will perform as intended for the term of the warranty, often 20 years. This all helps to provide: Builders, Architects, and Building Owners piece of mind and downside protection at the same time. website before but after looking att some of the posts I realized it�s new to me.